There are over 150 spaces directly outside the centre offering 2hrs of free parking. There are specially designated parking bays for guests with special needs located throughout the car park. The centre has also been awarded Disabled Parking Excellence by Disabled Motoring UK. View our certificate here. To find out more call the Management Office on 0141 440 2555. Visiting the centre couldn't be easier. 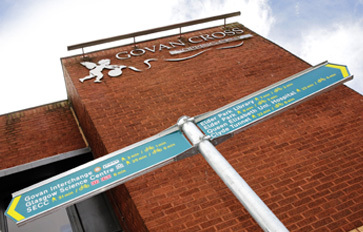 Govan Cross Shopping Centre is located in the heart of Govan on the south bank of the River Clyde, approximately 2.5 miles west of Glasgow. During the summer you can use the Govan Ferry to cross from Govan to the Riverside Museum and Partick. The free service runs day 8am to 6pm Monday to Friday and 9.45am to 5.30pm on Saturday and Sundays. The ferry terminal is located at the pontoon at the bottom of Water Row at Harland Way.